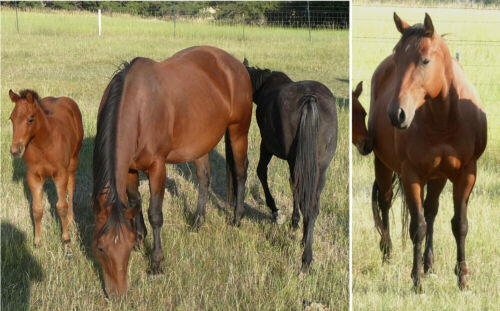 Listed here are mostly older, unbroke horses, or other "oddities" like a Quarter Pony. 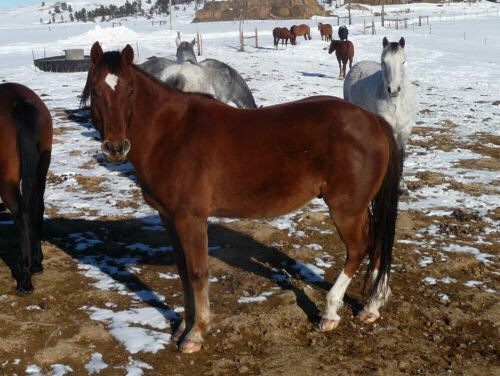 This mare is by our herd sire Dorky Frosty Spark, an own son of Frosty Feature, and out of one of our saddle horses, a quick yet mellow registered Quarter Horse mare. 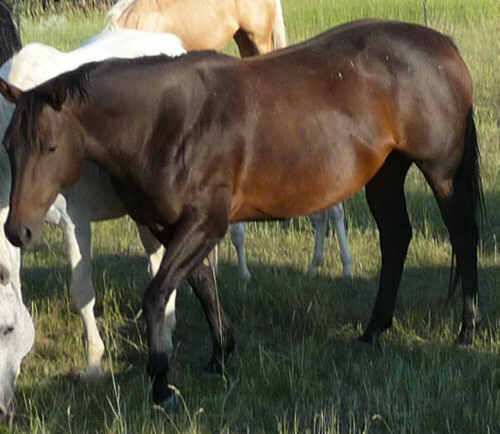 Hota is not registered with AQHA. 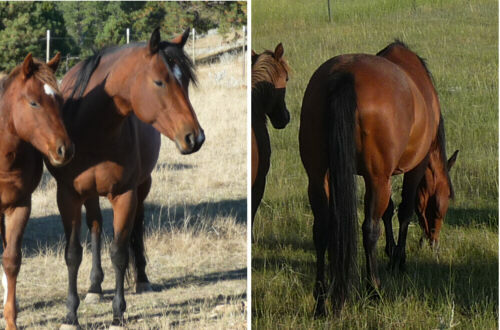 One of our cowboys bought Hota as a 2year old but did not get around to start her under saddle. 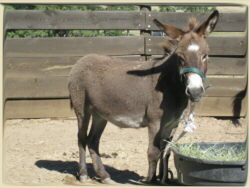 She is halter broke and had a saddle on her back, although she is not broke to ride. She is app 15.1 hands tall and very stout build. Her full and half siblings excel on the ranch working cattle and showing hardiness and stamina all day paired with a good disposition and easy trainability. This mare is by DORKY FROSTY PARK, an own son of FROSTY FEATURE, and out of DELLA, a proven ranch mare with a very good disposition. Despite the impressive size of Della we use her for little kids to ride on cattle drives. Frosty Della Two has not been handled. 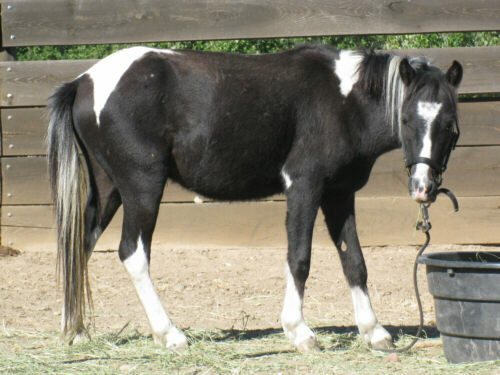 She had a foal in 2008 and 2009. This gelding is by DORKY FROSTY PARK, an own son of FROSTY FEATURE, and out of BLONDIE, a very pretty chestnut mare with DASH FOR CASH breeding. This mare is not a beginners horse but has the stamina to get a job done, probably the fastest horse we have at the ranch. 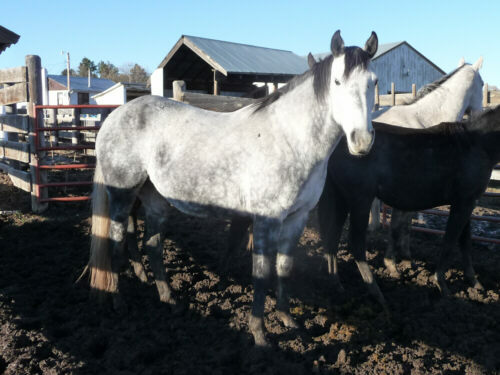 With Frosty Feature on top and this mare on the bottom this gelding should have the speed to outrun everything. He is at least 15.2 hands tall. Blondie's Frosty had 30 days professional training in November 2008. Unfortunately we did not get around to put any more saddle time on him. Frosty Della Three has not been handled. She had a foal in 2009. This little gelding was handled since he was a weanling colt and had a few rides on him this summer. He measures appr. 13 hands and is the perfect size for a 4H kid to work and have fun with. He is out of Quarter Horse bloodlines and should have some cow sense bred into him. We do not sell him as broke or even green broke due to lack of serious continuous training but as a little project horse. 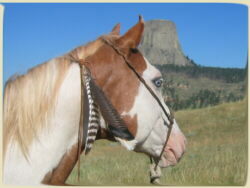 We do recommend him for an older child with horse experience or supervised by parents with some horse knowledge. He is very well put together and just looks like a perfect horse in small edition. Frenchmans Grade is a grand daughter of FRENCHMANS GUY and throws, bred with our own son of Frosty Feature, pretty headed barrel race prospects. She has not been handled, app. 15.1 hd. We bought her as a weanling with her registration pending, but due to bureaucratic reasons we never got her registration certification, therefore she sells grade. 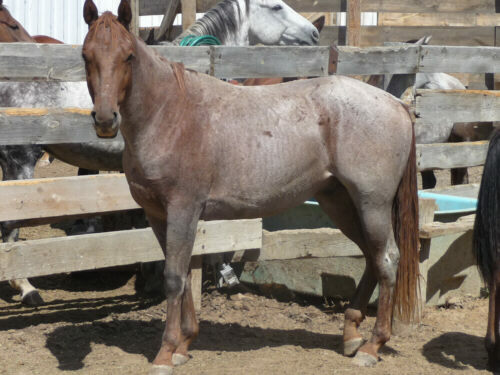 This mare is by DORKY FROSTY PARK, an own son of FROSTY FEATURE, and out of AME GO RED GLO, a proven ranch mare. Frosty Chestnut has some round pen training and was started under saddle in the roundpen in 2007 and 2008, however, she has not had any outside rides. 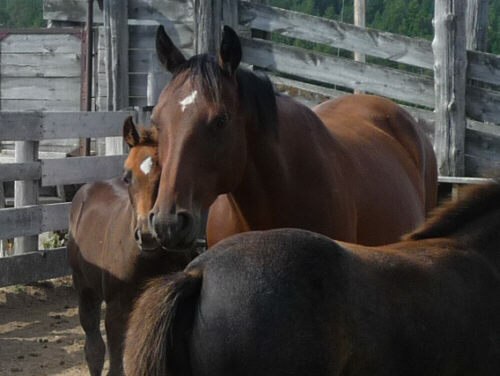 This mare is by DORKY FROSTY PARK, an own son of FROSTY FEATURE, and out of CHOCOLATE, a dark brown mare with a lot of speed and energy. This mare was not a beginners horse but had the stamina to get a job done. Frosty Chocolate has not been handled. Roani was worked with some in the round pen this summer until we found out that he did not drop both of his testicles. He is a cryptorchid and needs surgery to remove his testicles. He sells very low priced due to the vet expences his new owner would have to expect. Roani does not act like a stud but gets along with mares and geldings just fine, we never saw him trying to mount a mare, either. 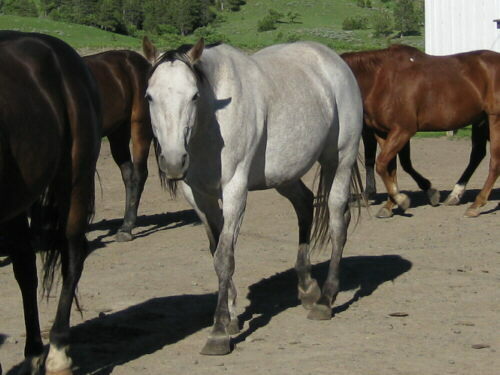 Roani is registered with AQHA. Snickers is a Shetland pony sized little gelding. He is friendly (no kick or bite), halter broke, and has been handled by kids. However, he might not have made the best experience at all times because he does like to run away. He is, nevertheless, easy to catch in the corral and stands nicely once caught. 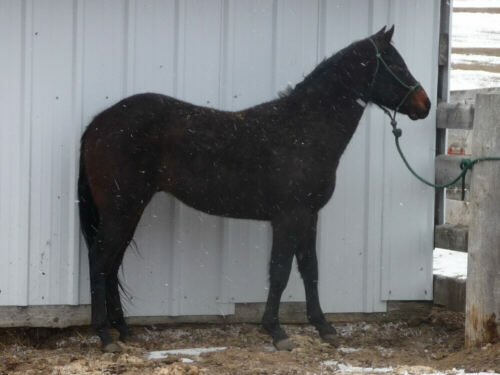 He stands 10 hands (40 inches) at the withers at this time and will probably mature around 10.2 to 11 hands. A perfect little project horse not for the very tiny kid but a 10 year old and up with some former horse/pony experience. Snickers is only 2 years old and thus not broke to ride.